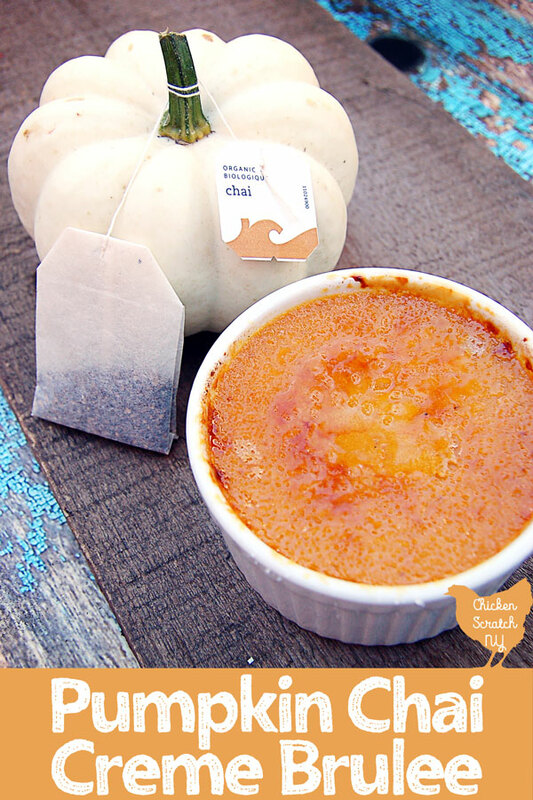 I was drinking a cup of iced chai yesterday thinking that it would make a great creme brulee, and why not add pumpkin just because? 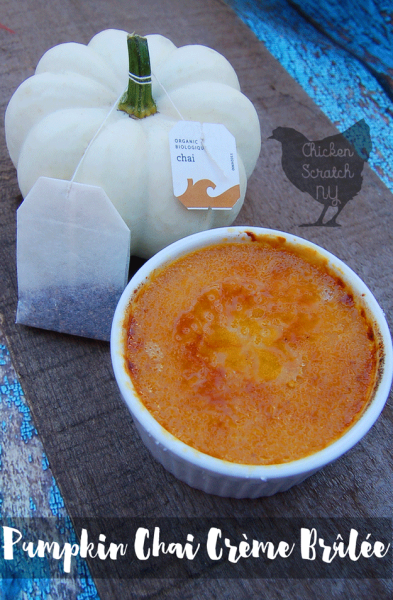 And so Pumpkin Chai Creme Brulee was born. I’ve made vanillacreme brulee before and it’s different than your average dessert but not hard. 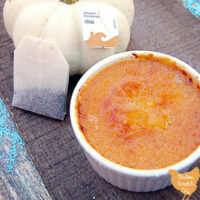 The creme part is a basic custard and the brulee is the crunchy caramelized sugar topping. Bonus points for the make ahead factor, the custards are fine in the fridge for a day or so. Add the sugar and toast it right before serving, the secret is to get the sugar to caramelize without heating up the custard. The best part of a creme brulee is cracking the sugar crust! Pumpkin fits right into a creamy creme. It’s smooth and doesn’t disrupt the silky texture. 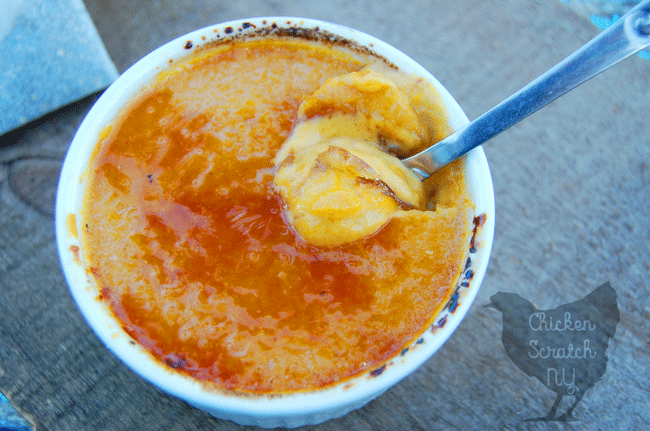 If you use homemade pumpkin puree make sure it’s completely smooth. As far as the flavoring, I love pumpkin spice more than any one rightfully should but sometimes I want to mix it up a little. So I turned to chai tea. A bag of chair tea to be exact. I don’t know about you but I absolutely hate getting a ‘pumpkin spice -insert food here-‘ when all it tastes like is a mouthful of gritty cinnamon. That was definitely something I wanted to avoid. Adding the tea to the cream while it heats infuses it with a gentle spice and tea flavor with none of the grittiness. and a stainless steel bowl for a double boiler. When you pull the bowl off the double boiler keep the water at a simmer. You’ll need the water to make a water bath for the custards. You could use water from a tea kettle but it’s already hot so why not use it? While the tea is steeping mix up the rest of the custard. I like to use a large Pyrex measuring cup. The spout makes it easy to pout into the ramekins. Slowly add the hot cream while whisking. Your goal is to not cook the eggs. Place a clean towel in the bottom of a 9×13 pan, set the ramekins inside. The towel keeps the cups in place once you add the water. Fill with pumpkin custard. Place the pan on the oven rack and fill with hot water. Loosely cover with foil and carefully push into the oven. Remove from the oven when the custard is set around the edges. They should still be jiggly in the center. Carefully transfer to a wire rack to cool down. Switch them to the fridge. Right before serving top the custard with sugar. Gently shake the sugar all over the custard. Quickly heat under the broiler or get fancy with a torch. Keep an eye on the sugar, it goes straight from melted caramel to burnt in a blink! 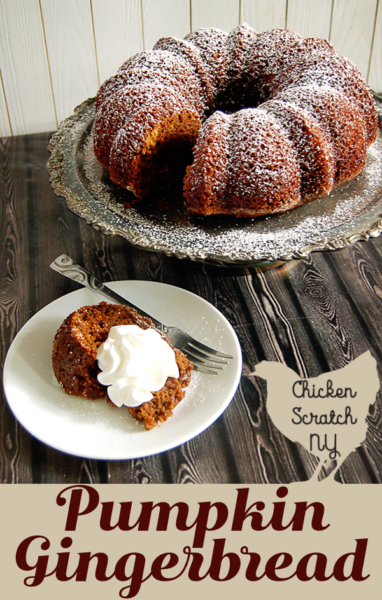 Don’t forget to PIN this to your Fall Recipe Board! Evenly fill the ramekins with the cream/pumpkin mixture, pull out the oven rack and place the pan on it. CAREFULLY pour the boiling water from your double boiler in the pan surrounding the ramekins. If you need more water add hot water from the tap. You really don't want to be moving the pan around ful of boiling water if you can avoid it! Loosely cover with foil, push in the rack and close the oven. You are making me super hungry with that. Thanks for sharing. WE love Creme Brûlée! I bet this spin on it is DELICIOUS!! I am loving all the new pumpkin and apple recipes going around. Fall is in the air for sure. Wow! I have always been afraid to try a creme brûlée. I love them, though and adding pumpkin spice sounds brilliant! Yummy! 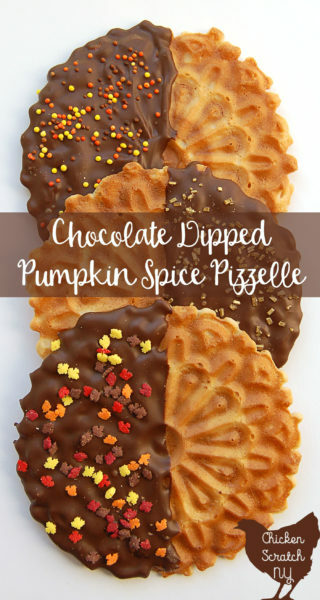 I love anything with pumpkin spice and this sounds super delicious! I will give this a try soon! i can see how the spice from the chai would taste great with the pumpkin. Great idea for fall and thanksgiving. Would rather creme brûlée over pie. I’ve never had creme brulee but that looks really good! Great combination of flavors. Oh my the pumpkin as a decor would be a delight for a gathering. The recipe its self sounds yummy. Will definitely be trying this.